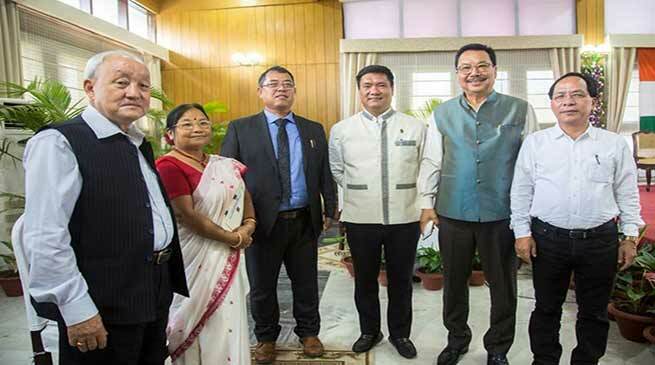 Nipo Nabam has been sworn-in as the Chairman, Arunachal Pradesh Public Service Commission (APPSC), while Ms Komoli Mossang was also sworn-in as member, APPSC on the occasion. The Governor of Arunachal Pradesh Brig. (Dr.) B.D. Mishra (Retd.) administered the Oath of Office and Oath of Secrecy to Nabam and Ms Mossang in the Darbar Hall, Raj Bhavan, Itanagar on 9th August 2018. First lady of the State Smt Neelam Misra, Chief Minister Pema Khandu, Deputy Chief Minister Chowna Mein, Speaker of State Legislative Assembly Er. T.N. Thongdok, Cabinet Ministers, members of Legislative Assembly, Chief Secretary Satya Gopal along with senior bureaucrats of the State, members of APPSC and distinguished guests and invitees were present on the occasion.